For a tea ware artist to create truly significant work, they must know Tea. Does the one who drinks tea in a serious manner have the responsibility to know and understand tea ware? When I sell my work in Asia, I have had the opportunity to talk with the customers directly. On my first encounters, now some years ago, I was surprised at their knowledge of the ceramic process as opposed to Western customers who more commonly simply bought what they liked and asked few questions. The Asian customers ask questions, “Is this wood fired or gas fired? What temperature do you fire at? Is that natural mountain stone in the clay body? Even, “How many times have you drunk matcha?” The latter question was a test to determine if I really understood Tea. But in the West, I very seldom get questions like that but have been asked if it the work was dishwasher safe. I created this blog for selfish reasons, one can never know enough about Tea and writing about it helps. In addition looking carefully at someone else’s work, work you respect, serves to educate us all. Park Jong Il’s ‘chatchan’ teacups and ‘chawan’ tea bowls are the foundation of his work – of any tea ware artist’s work..
Jong Il’s are all simple functional ware and rely on “outer powers” for many of the effects achieved. The clay body, glaze, kiln, even wheel and other things have as much to do with the work as he does. For me, that is one of the signs of a good tea ware artist. They are one with nature and use nature in their work. I will begin with some of his teacups. For many reasons, teacups do not receive the same respect as tea bowls. First, they are small. Second, they are usually not expensive. Third, Korea’s who drink tea use chatchan every day as common ware. Fourth, there is a mystery surrounding tea bowls that has elevated their status beyond imagination. 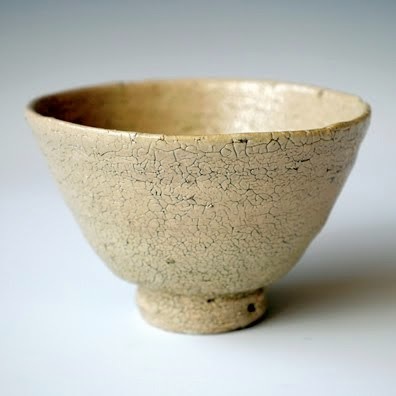 A simple Korean or Japanese chawan made today by a known artist may be sold for thousands of dollars. Even an unknown tea ware artist may receive hundreds or even thousands of dollars if the look is right. While a teacup made by the same artist with few exceptions remains reasonably priced. The time and effort to create a chatchan or a chawan are similar. For an experienced tea ware artist it takes just seconds more to form a chawan. It is no wonder that some tea ware artists have decided to only make chawan. But the reason for this is not only financial. This issue is explored more fully on my blog www.dawan-chawan-chassabal.blogspot.com. Park Jong Il is a complete tea ware artist. As you are seeing, he produces a full line of tea ware. I will be showing a greater selection of his chatchan in a later blog. You have seen his porcelain and in doing so have discovered that he uses more than one clay body. Many ceramic artists use just one clay body. Park Jong Il uses many clay bodies as each clay body contributes to the final result. Jong Il's chatchan are beautiful. The four cups to the right measure approximately 2” x 3” or 5 cm x 7.5 cm. The left one is slightly smaller. All have a similar clay body that is rich in iron. Brown is one of the preferred colors for matcha but these are for infused tea that looks good with many colors even clear glass – an admission difficult for a potter to make. The cup to the left is glazed with a simple glaze revealing the dark body. At first glance one might think that the four cups to the right are all glazed the same but on closer examination there are two sets. 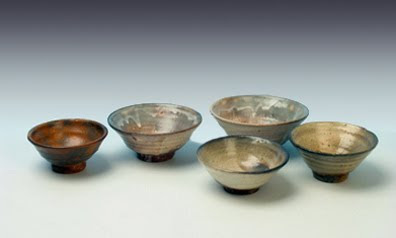 All four are tum bung buncheong or dipped into slip buncheong* but both the slips and glazes are slightly different. You might ask why an artist would take the time to use different slips and glazes to create similar results. The answer is in the word ‘artist’. Artists see beyond “first glance”. The more we look at these two sets of chatchan the more different they become – beautiful. Aesthetically chatchan follow similar principals as chawan. In essence they are chawan in miniature and should be enjoyed in the same manner. Such a phenomenon can be found in the prices of small saki cups in Japan that can match the prices of chawan. Jong Il’s chawan are simple and spiritual, reflecting the man and his approach to Tea and tea ware. This bowl is quite deep, even deeper than an ‘ido’ bowl and fits the hand beautifully. It is glazed with a simple “dry” glaze composed of feldspar and ashes. Nearly any combination of these two ingredients 'works". On occasion tiny natural stones in the clay body interrupt the ‘sharkskin’ surface and gently influenced the rim. The bowl is quiet and humble and a great color for matcha. But matcha looks great with a variety of tones of several colors so it becomes a matter of taste, personality and mood as to which chawan one selects for their bowl for a particular event. It is like selecting which tea to drink that morning with which teacup, or which teapot should be used with which tea? 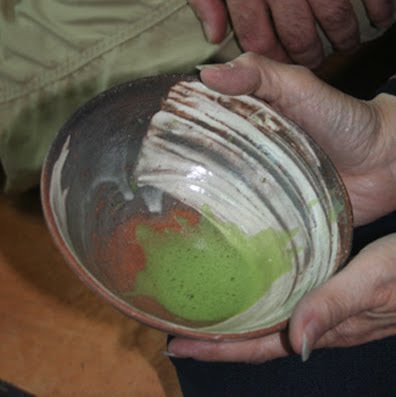 So a collector of chawan, who is truly into Tea, and enjoys matcha, will have many tea bowls in their collection and may pay considerable sums for them. 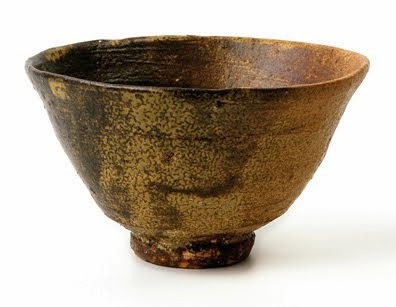 Korea’s Human National Treasure in pottery, Kim Jong Ok, receives as much as the equivalent of $7000 USD for a single bowl. I know others who have received even more. But most artists, including Park Jong Il, have much more modest prices. 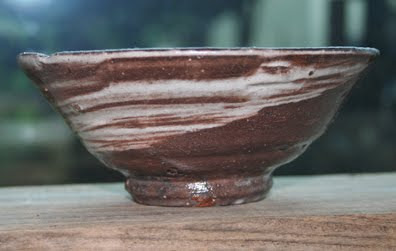 The above bowl is glazed with an unusual slip glaze on an iron rich clay body. Again, Park Jong Il uses several clay bodies as each has its own voice in the final result. This piece is more heavily reduced than the first and iron is pulled from the glaze and clay body creating a very different result. This bowl is masculine, the previous bowl more feminine. Both were quickly formed. Yet both chawan maintain a quiet, strong presence and reflect the personality of the same maker. I call this a gama sabal or 'kiln' bowl. So called because the kiln had as much to do with this tea bowl as the potter. It captures the perfect balance between the inner and outer powers necessary to achieve quality chawan. 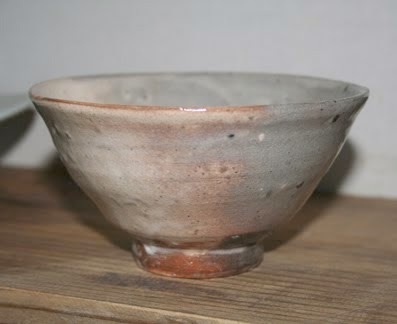 If this bowl were glazed with a ‘shino’ glaze, the Japanese would call it “rat shino” because of the color change caused simply by the change of gray reduction to white oxidation on the same piece. The term ‘reduction’ refers to the reduction of oxygen during the firing. When oxygen in needed, and not present, oxygen is ‘pulled’ from the oxides in the glaze and clay body causing them to change color. This is the same effect that’s necessary to produce copper reds and celadon chungja glazes*. But surprise, this bowl is glazed with the same slip and glaze as two of the chatchan above and is ‘tum bung buncheong’*. It was dipped into a thin clay slip tum bung over a darker clay body. In the beautiful chawan above, you can almost see the reduction smoke and flames swirling around, now frozen in that perfect moment. This ‘gqey yl’ or brushed slip ‘buncheong’ or gqey yl buncheong piece is simply beautiful and is decorated using one of the old ‘buncheong’ methods for decorating with white slip. Slip in this case was applied with a rough brush. The slip was applied without hesitation – direct and in one movement. The ‘line’ of this bowl also reflects the quickness of forming – both turning or throwing and trimming on a wheel. In Korea, trimming is as important to the forming process as turning. The interior, revealed here with some remaining matcha, shows the uneven reduction often prized by tea ware connoisseurs. This bowl “moves in its stillness” and is a good example of Jong Il’s work. I’m sorry that I don’t have photos of all sides of these chawan including the bottom of the foot. The latter two photos were taken in Jong Il’s Tea/gallery while the first two photo are from his collection. My next posting on Park Jong Il will be on his kiln followed by his family. *‘Buncheong’ powder, is a relatively new term for a group of slip decorating processes used in Korea between 1392 and approximately 1592. The use of these methods had already been slowly dying in favor of porcelain when Hideyoshi’s samurai warriors invaded Korea during the Imjin War (1592-1596) insuring the demise of these ‘buncheong’ processes. Approximately 70,000 prisoners were taken to Japan as captives. These included artisans of many kinds, men, women, and children. Included were hundreds of Korea’s most important literati. Included also were approximately 2000 ceramic artists. The war is nicknamed the Pottery War by some scholars. Captive Korean potters began many of Japan’s now famous pottery villages. One prominent expert on both Korean and Japanese arts and culture told me that if we were to remove all the Korean influences from Japanese ceramics, it would be like removing all African American musicians from the Jazz Hall of Fame. The Japanese call the various Korean buncheong processes mishima and have identified more than 20 different types. *The “secret color” of celadon is achieved by the use of iron in the clay body and/or glaze and the proper amount of reduction during the firing. In celadon the oxidation would have been yellow while the perfect reduction becomes “kingfisher blue” cheongja or what we know as “celadon”. Over-reduced the celadon turns gray. During the 1300’s Chinese scholars declared that one of the finest things under heaver was Korean celadon – everything else was Chinese. To learn more about celadon check the website www.GangjinCeladon.com. As for Korea’s use of copper red; Korea used copper red on pottery two hundred years before China. Koreans have been masters of reduction firing since the bronze age. *I have changed my spelling for powdered tea from "matcha" to "maccha". While both spellings are used on a regular basis by different authors, "maccha" is the preferred spelling by the Japanese and it is presumed at this time to be a Japanese word. Ref: www.jagasilk.com/maccha-or-matcha. What word do the Chinese use for powdered tea?